Tomorrow is the "first day of instruction" for the last semester of school for the rest of my life. 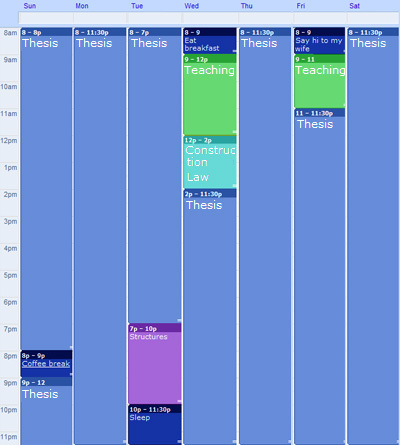 I like to think that thesis is one big blue sky. Not an oppressive thing at all, just something to call that white noise in the background. Thesis is the agar agar in the petri dish labelled "growth, January to May". Or rather, all of this time is the agar agar in which, one hopes, a little thesis-culture flourishes into a full fledged colony. I'm teaching this semester too. It's a drawing/computer skills seminar attached to the Env Des 11B studio (the first design studio for undergrads). That should be a nice break from the endless hours on the 9th floor, surfing the clouds. "...for the rest of my life." oh quit being so over-dramatic!